I have had a good many people enquiring about Calco for two essential reasons, (1) because it is such an efficient, reasonably priced, low ash, high heat output fuel, and (2) because some people are worried about it possibly causing damage to stoves. Calco mix has esentially two main components, as shown in the above photograph, it is a mixture of petro-coke and lignite nuggets. I estimate the mix to be very roughly 3/4 petro-coke to 1/4 lignite nuggets. It is one of the most efficient smokeless coals available, and if it is used correctly, it represents superb value for money. I have been using Calco mix for two years, and I have seen no perceivable damage in that time. There is a caveat though, Calco is very capable of doing damage if used incorrectly. If you were to fill a stove with Calco and just let it rip, it will redden the stove - and will undoubtedly damage or burn the metal of the stove. This is because petro-coke is a coke - coke is used in smelters to melt iron, cokes are capable of achieving very high temperatures. However, control the air intake, and thereby the temperature achieved, and you will not have problems. The purpose of the lignite in the mix is to give an amount of ash, up to 19% in some lignite, and a percentage of a fuel with much lower temperature burning characteristics. This modifies the overall burning rate and the ash helps protect the grates and baffles of a stove. Some stove manufacturers will not guarantee their appliances if Calco is being used, and they are probably justified, because many people have not got a clue about how to properly control the burn in a solid fuel stove. I have just checked prices for this winter with our local dealer in County Kerry, Econ Fuels, Monavalley, Tralee tel: 066-4011099. Calco Petrocoke mix is €1 dearer this winter at €15.99 per 40Kg bag, or 3 bags for €45. They also have Lignite Nuggets at €14.99 per 40Kg bag or 3 bags for €43 if you prefer to play safe with your stove. The guys at Econ Fuels say the price increase is due to increased transport costs, which in turn are due to massive price increases and Ireland's extra taxation on motor fuels. It has come to my attention from several regular users of Calco Mix that there has been high level of stones and pieces of concrete etc. found in Calco. One lady told me that an exploding stone had broken the glass of her stove. I my self have found a collection of extraneous bits and pieces in my Calco-Mix of late. Some are harmless bits of wood etc. others are less benign. Either the agents or those making the mix are quite careless, or could it ever be possible that this EXTRA material is being added intentionally for some reason unknown?? 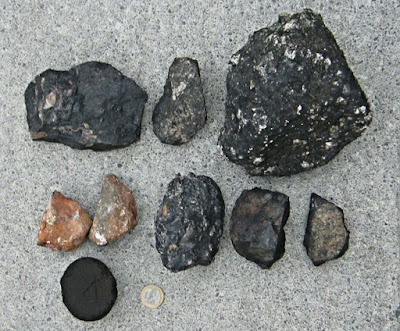 Above is a photo I have just taken showing a collection of rocks and concrete I found in my Calco. 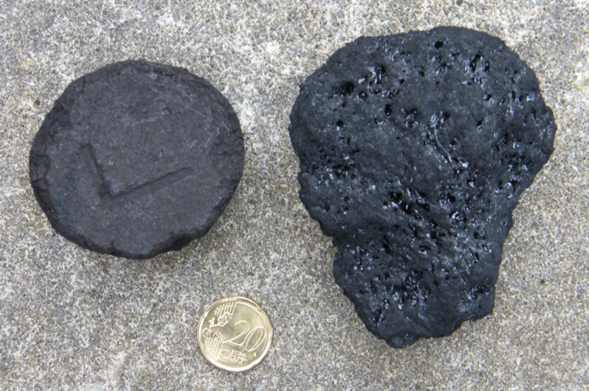 The lignite briquette and the 1 Euro coin and there just to show scale. The two brownish stones are that colour because they came out of the fire. Luckily I had discovered the rest before placing them in the fire. That collection represents the use of perhaps 2 to 3 bags of Calco - that is a fair bit of extraneous matter. Apart from devaluing the Calco, there is always the dangers presented by an exploding stone in the fire. I will reserve final judgement but suffice it to say I have lost some of my enthusiasm for Calco-Mix.